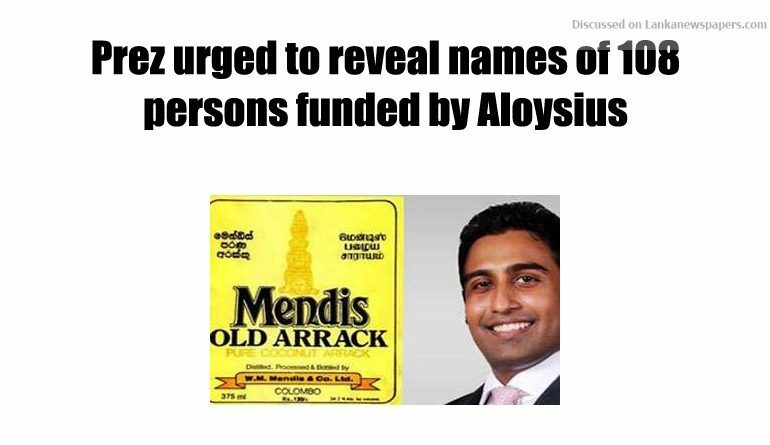 President of Inter Company Employers Union and the National Organizer of Voice against Corruption Wasantha Samarasinghe today urged President Maithripala Sirisena to reveal the names of those who have obtained money from Mendis Distilleries belonging to Arjun Aloysius. Mr. Samarasinghe told a media briefing that a total of Rs 1.9 billion has been given to 108 persons and the names of these persons should be revealed forthwith. He charged that money has been offered to some who were in the Presidential Commission appointed to look into the Bond Scam and to politicians. “This was revealed by the Presidential Commission report and therefore we urge President Maithripala Sirisena to reveal these names,” he said.